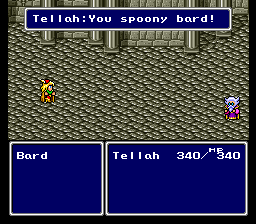 It is well-known that the official English Super NES version of Final Fantasy IV, Final Fantasy II, has a terribly written script. Chock-full of censorship, poor translations, awkward phrasings; combined with the removal of various content, it was an insult to the intelligence and the reading comprehension of gamers everywhere! J2e set out with a goal to remedy this by translating the Japanese version, yet at the price of a hack-job hacking job and many inside jokes added in unfitting places for the fun of it—and the script itself still left something to be desired. Enter Project II. Using Pinkpuff and company's editor, FF4kster, I have entirely rewritten the script of Final Fantasy II from scratch, utilizing various elements from nearly every English version of Final Fantasy IV, as well as taking cues from Tomato's findings at the famous FFIV page at his site, Legends of Localization. This wasn't enough, however. There was more that needed to be done. Dummied content has been restored; battle commands enjoy vast upgrades; enemy item drops have been reverted and improved; shop inventories have been updated, using the Japanese game as a close guideline; Sirens can now be bought; other authors' improvements have been added. Download Project II v2.40 now. Grimoire LD: Fixes to bugs induced by vivify93's hacking and Critical Hit Fix. Pinkpuff: Fixes to bugs induced by vivify93's hacking. 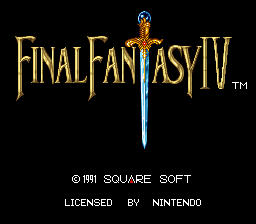 Paladin: New and improved title screen from FF4: Paladin Edition. Dragonsbrethren: Creative ideas, Warp Animation Enabling patch. Deathlike2: Yang's HP fix, Magic Plus, Weapon Restoration, Protect and Shell Improvement, Bit Improvement, Sing Improvement, and Goblin Summon Improvement. Dragoon ZERO: Long Range fix. chillyfeez: Final Fantasy IV: User Options and Critical Hit Fix. This is work is my apex, Project II: Final Fantasy IV. Please, enjoy the result of my blood, sweat, and tears. Please, enjoy the result of my blood, sweat, and tears. But this looks pretty neat. I really love this idea. I might take another stab at Final Fantasy IV again. I wonder though, why not just add your translation and bug fixes to the Japanese version? I know I thought of doing that to my hack :http://www.romhacking.net/hacks/1386/ but don't have the know how to make it work properly. I love the new title screen. Thanks, hope you check it out! I really love this idea. I might take another stab at Final Fantasy IV again. I wonder though, why not just add your translation and bug fixes to the Japanese version? I know I thought of doing that to my hack :http://www.romhacking.net/hacks/1386/ but don't have the know how to make it work properly. There's a couple of reasons for this, actually; for one thing, despite my credits page on RHDN, I'm nowhere near as skilled a game modder as other people on this site. I can barely do graphics and text, to be honest! For another, it was FFII US specifically that I wanted to do this for. I've known for a long time that Kaoru Moriyama's FFII has a subpar script, and I wanted to set out and remedy this. Another reason was that I wanted to give FF4kster some free press with the Project, and it doesn't work with the Japanese version of FFIV. I love the new title screen. Thank you; all credits for that go to Paladin of Paladinet.com! I have always liked the title screen in his mod. Wonder if I could convince him to port his changes to Project II's script. I would be honored for Project II to be your first Final Fantasy IV experience. Looks good. Did you add a battle gauge? Unfortunately not; but it would've been a lovely addition! I was hoping someone would get around to doing this! J2e is, in my opinion, atrocious. Not just the dialogue itself but the font looks icky. Besides, changing such iconic character names gets on my nerves so much I have to change them back to normal first chance I get. There's just one tiny, itty-bitty detail that bugs me. There's a column of empty space on each side of the main text boxes that is never used in the original game and you didn't make use of it. For example, look at the bottom-left screenshot. See the empty space on the far left and right in the text box? That's what I'm talking about. I mean, why have that space there if you never use it? Other than that, great work! I'll enjoy reliving this SNES classic like I always wanted. That's actually a part of the game's routine! I'm not that skilled of a hacker, so I couldn't do anything with it. I think it's there in case of over-scan issues on CRT TVs. I'm suprised you didn't rename the items or spells. I know space is an issue, but Lit always bugged me as a spell name. I like the translation so far. It almost feels like a refined version of the US FFII so far. I did rename a lot, a lot of the items, actually. I just had them mostly fit in with FFIII US. Tonic, Potion, X-Potion, Tincture, Ether... Keep in mind this stuff was Cure1, Cure2, Cure3, Ether1, and Ether2 before. Are you actually mostly just asking me why I kept Lit and didn't change it to Bolt? My reasoning was, a lot of FF translations called it Lit back then, and I wanted to preserve that. It gives it a touch of uniqueness that is only found in translations of the era. I'm glad you're enjoying it! Let me know if you find anything that could serve to be improved upon. Ah, I gotcha. I knew old games did compensate for overscan, but I still don't see the point of having that extra space. Not complaining to you, mind, just ranting a bit about the original game. I like how you used little double-letter icons (li, ll, etc.). It looked a bit weird at first, but upon getting used to it, it looks really good. I also enjoy it since I can put in Allison as Rosa's name. I just have to leave out one t in my name, since there's no tt icon. Oh well, it doesn't look horrible with only one 1. EDIT: Bug report. The MagicMap and EyeDrops descriptions are just "D". This might also be for other items. EDIT2: As I've played more of the game, I've noticed how weird some of the icons make options look. For example: Call. I personally think it would look better if it was spelled out all the way instead of with the ll. That might just be me, though. Bug report. The MagicMap and EyeDrops descriptions are just "D". This might also be for other items. You didn't check the readme, I see! I outlined that in the "Left to Do" section. That's why Item_List.TXT exists in this version of the mod. I like it as it is now, but that's not to say I'm not going to undo it if I don't get enough complaints about it. Even then, I'd still be using the il / li / ll icons in places that necessitate it, like for the Recall command, and a fair handful of enemy names. I glanced over it, but I must've missed that little detail. Oops. Using the icons when necessary is totally fine, I just think Call would look better if it was spelled out all the way, since it's right under White and Black. Something else I noticed that could use a touch up: on the Status screen, you used the il icon in Will. I personally think it would look better if you used the ll icon instead. I also noticed some inconsistency regarding the il icon; you used it by default for Cecil, but didn't make use of it for Sheila (Yang's wife). Not a huge deal, just thought I'd point it out. One more thing. 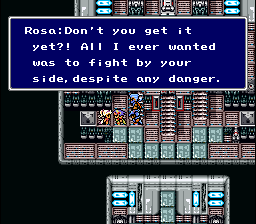 This is probably me just being nitpicky, but I think you should change Rosa from a "Wh.Wiz." to a "Wh.Mage". Wizard implies a guy, right? Besides, Mage doesn't need an abbreviation, so in my opinion it would look better. Have you played this yet? Actually, no. Nevermind then, ignore my request, this seems like it fits what I'm looking for. Thanks! Oh, geez, I'm sorry; I had no idea you were still editing that post. I feel terrible now. I also noticed some inconsistency regarding the il icon; you used it by default for Cecil, but didn't make use of it for Sheila (Yang's wife). Not a huge deal, just thought I'd point it out. Well, I used it for Cecil because you can actually name him. If you noticed, I didn't use any of the il / li / ll icons in the out-of-battle dialogue, just the menu text and in-battle stuff. Since "Cecil" is a name variable, it counts as a menu item even when drawn in the out-of-battle dialogue, so it can display properly in dialogue because of that. il / li / ll all use the same hex byte as dual-tile encoding for the main game script; even if I wanted to insert them, it wouldn't work. In the Sheila example, it would show up as "Shetha" due to the il icon sharing the "th" DTE's byte. I hope this makes sense. I kept Rosa as a White Wizard because I felt she would be much wiser than a fledgling White Mage like Porom. The Woolsey Uncensored Edition is a good patch, as previously linked, but if you want something closer to the Project's ideal, I recommend Stand Guard, which reinvigorates the vast majority of the text. I was going to make a Project I and a Project III, actually, but the ideas fell through since I figure one could just play the GBA version of FFVI for its edited text; just get the European release, slap on the font facelift, the uncensored graphics patch, General Violence, color restorer, sound restorer, and maybe the Woolsey-Slattery Compromise patch if you're feeling festive. Not so with Final Fantasy IV "Slowdown Glitch-fest" Advance. If people want to play something with the original-size sprites and original-style graphics, they're stuck with FFIV PS1 (Slowdown), FFII US (Terrible script, missing content), J2e's translation (Need I say more? ), or the GBA game. The European version of FFIV Advance is much more polished, in case you didn't know. Glitches were fixed and plus it has a sound restoration. I only wish you could somehow hack the SNES version to make the menus a little more polished. That's one thing that bugs me about FFIV that they fixed in the Advance version: how slow and clunky the menus are. EDIT: I've tried out Stand Guard. While it does reinvigorate a bunch of the text, to me it feels like a spoof or a parody rather than just a script improvement due to how many liberties the script takes from the original. Also the character descriptions are very ugly and don't flow well. Granted, there are some nice things (the font is nice and the increased running speed is also convenient), but the Woolsey Uncensored patch is more what I'm looking for. Buuut it didn't fix any of the slowdown. Cecil's Dark is lightning-fast in the original, and tons, tons slower in the GBA port, for example. True, but that slowdown also exists in FFVI Advance with one of Sabin's blitzes. I believe it's called Rising Pheonix? It's the fire one where a bunch of red Sabin clones fly around the enemies.